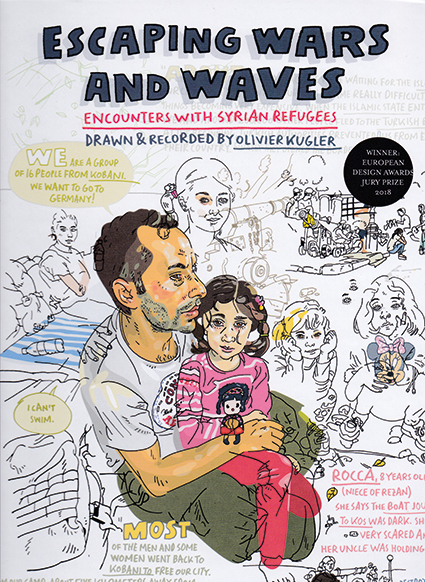 Olivier Kugler is a German journalist and cartoonist who combines his talents to tell the stories of those he interviews. Escaping Wars And Waves is a collection of the individuals and families he met who were fleeing from the Syrian conflict. Travelling to Iraqi Kurdistan, the Greek island of Kos and the Calais camp known as the Jungle, as well as visiting refugees now living in the UK and Germany, he steadily builds a picture of tragedy, desperation and hope, of people just wanting to live a normal life and give their children a fighting chance. Many of the stories show extreme hardship and detail difficult and deadly journeys across land and sea, as well as hostility, hunger and helplessness. But at the heart of every page is an individual’s testimony, a snapshot of their existence and experience that is extremely effective in showing the human anguish and resilience of those displaced. The key to the effectiveness of Kugler’s reporting is that he gets permission from his interviewees to photograph them and their surroundings, then builds an illustration around those pictures that is peppered with the finer details of their often meagre lives, and overlaid with the subject’s words and Kugler’s notes. At first glance the pages can look jumbled and complicated, but there is always a narrative to follow as you read across the page, revealing a gifted eye for design and storytelling. The apparent unfinished nature of Kugler’s illustrations, coupled with their snapshots of the surrounding minutiae, contrive to make the interviews feel more immediate and real – a snatched moment in time, which of course they are. Our experiences of the Syrian conflict is so often through our television or phone screens, and in that way it’s too easy to dismiss the suffering of the populace as they are presented as distance faces huddled in camps, boats and beaches. This book helps show that they’re all individuals with the same hopes and needs as you and I, fleeing a war they didn’t create as they try to find that elusive replacement for what was their home. It then becomes all to easy to put yourself in their shoes and imagine what you would do, what lengths you would go to give your family a chance. This is a brilliant example of the power and versatility of the medium – engaging, informative, shocking and even heart-warming. A book we should all take the time to read. And if you liked that: Read Joe Sacco’s Palestine.